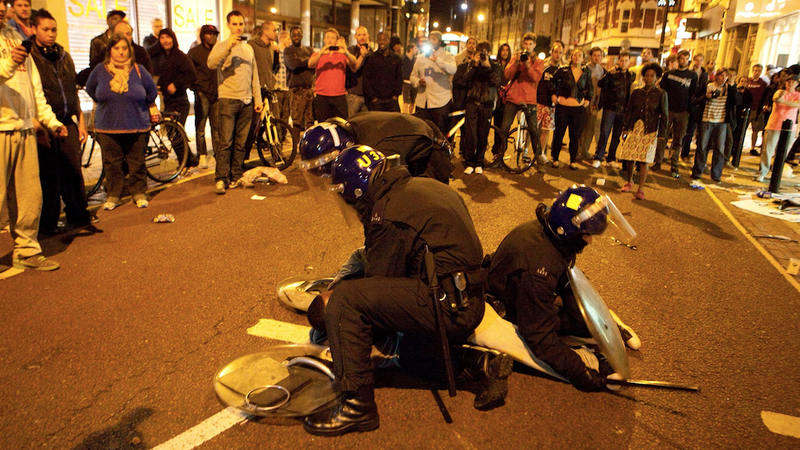 Researchers in the UK used machine learning algorithms to analyze 1.6 million tweets in London during the infamous 2011 riots, which resulted in widespread looting, property destruction and over 3,000 arrests. According to the researchers, analyzing Twitter data to map out where violence occurred in London boroughs was faster and more accurate than relying on emergency calls—or even on-the-ground information gathering. Essentially, the researchers used machine learning to collect tweets posted during the riots, then clustered them according to variables like location, time sent, and hashtags used. Each cluster was given a timestamp: 1:00pm to 2:00pm, for example, or 5:00am to 6:00am. What researchers found was that disruptive events like windows breaking, fires, and unruly groups of people were consistently tweeted out anywhere from five minutes to an hour before London police knew about them. This tweet, for example, went out at 9:54pm. London police’s first record of looting on Fore Street came 45 minutes later at 10:40PM. Researchers could then geolocate incidents either from context or by extracting location metadata from tweets and attached photos, letting them map out where incidents were popping up in what would be real time, even before police were aware of them. Dr. Pete Burnap, a Cardiff University researcher and co-author of the paper, says he imagines crisis responders using this when deciding where to send crucial resources. But there is a potential downside to flagging activity for law enforcement before it escalates. Sending police to monitor crowd activity before it becomes violent can have a chilling effect, interfering with people’s right to assembly and voice dissent. What happens when officers, expecting trouble, can instantly pop up as soon as people voice complaints? Would that discourage organic protests? Burnap’s research also has some somewhat troubling overlaps with Geofeedia, the social media surveillance service police departments used in 2016 to track and profile Black Lives Matter activists. There, police departments tracked protestors by geotagging tweets and Facebook posts in real time, even using facial recognition to match protestors to criminal databases. Though Facebook and Twitter revoked Geofeedia’s access to their API, police departments still use similar services. Does Dr. Burnap think this type of early detection could similarly be used to surveil protests or target activists? The algorithms in the study don’t pinpoint or track specific Twitter users like Geofeedia did and Dr. Burnap says police presence alone isn’t enough to deter lawful protests. “I don’t necessarily think it should have an effect on calm, organized protest because they generally inform the police anyway,” Dr. Burnap said, acknowledging the importance of reigning in the practice so it doesn’t give police the type of “predictive” power as seen with other social media surveillance software.